60 entries for Rosa Agustini in Avezzano. Sem won the junior class and made it al the way to BEST OF BREED Hugo won the dog CAC and got reserve best dog behind Sem. On Sunday we learned so much more about truffle search. It has been another amazing experience. During the international dogshow in Rotterdam we entered only one dog for one day. Hugo made it all the way to the top six in group8. On saturday Flurry (Rozebottel’s Snow Flurry) was shown by her young and talented handler for the very first time. They did a great job. Hugo won the breed and group! Time finished her Dutch title and became BOS to Hugo. Hugo was the only dog we showed at Crufts. He won Best Dog BOS. We are extremely proud on him. Such a fun boy to show. Also known as the Italian truffle dog. 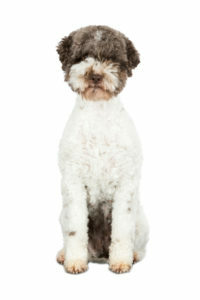 With a distinctive curly coat which requires regular maintenance. Small to medium-sized dog. Intelligent, fast and agile. Sometimes a little reserved. Originally used for hunting the waterfowl, now known as the truffle dog. Our Lagotto are fed exclusively with Fish4Dogs kibble. Since 2017 we are ambassadors for Fish4Dogs benelux. As a result, we are on a regularly base present at Fish4Dogs booth during dog exhibitions.